Storm damage and extreme weather conditions / poorly installed or damaged insulation, and / or construction issues. In recent years Ace Wall Ties Ltd have been inundated with enquiries regarding water ingress and dampness issues. 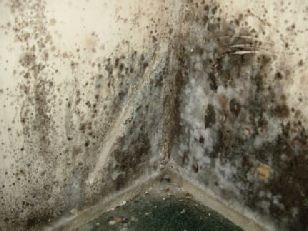 Many of these damp problems are directly connected to the cavity insulation present within so many of our homes and properties. Many homeowners are now faced with major damp problems through no fault of their own. Prior to the advent of “cavity constructed walls” properties were built in a ‘solid’ bond with no cavity or void. Dampness and water ingress was obviously a problem and one that was overcome when walls were built with a cavities. These cavities were designed to stop wind driven rain from reaching the inner wall. The outer wall was capable of taking the worst of our British weather without the inner wall ever becoming wet. However, when a cavity is filled with ‘retro-fitted’ insulation material the cavity cannot breath and allow air to flow as well as a clear cavity. When the outer wall becomes saturated, it is inevitable that this moisture will and often does track into the insulation material and will eventually reach the inner wall. Once this occurs there is little or no air circulation to allow the fibre material/insulation to sufficiently dry out. One successive wet winter after another exacerbates the situation and causes internal dampness and this may become a major issue to deal with. Ace Wall Ties have now removed the insulation from hundreds of properties in order to rectify the many damp problems directly atrributable to cavity wall insualtion, and have now become specialists in this field. Unlike some local companies we DO NOT need to remove dozens of bricks to successfully remove ALL insulation from the cavity void. Removing unnecessary brickwork can result in the destabilization of the outer wall, and poor workmanship can force new mortar back into the cleared cavity when re-fitting the removed bricks, not to mention the mess that is created. We use a high-pressure compressed air system and very powerful industrial vacuums to ensure ALL insulation is removed. 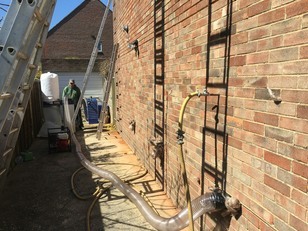 By drilling a series of small holes across the elevations and window heads, we can blast the material down the wall using air lances to selectively removed bricks along the ground floor, where it is vacuumed out and bagged up, no Mess is made during this process. New air bricks are installed as a courtesy to aid ventilation in the cavity and help speed up the drying process of the saturated walls. A boroscope is used to confirm all areas of the cavity are totally clear and if you (the customer) are present our staff will be more than happy to show you views inside the cavity. Our Specialist Surveyors (Lee or Nick) will be happy to discuss your individual requirements, and offer a constructive way forward. Ace Wall Ties will safely remove the insulation, solve your damp problem, and ensure that the cavity is completely clear and your house looks exactly as it did before we started.